For an extra £30, participants can stay until Monday morning, including supper and B&B. This course is now fully booked – please contact if you’d like to be put on the waiting list. Guaranteed to be one of Halsway’s noisiest weekends, this Hurdy-Gurdy takeover is a brilliant opportunity to get together with some of the best of Europe’s players in an intensive learning weekend of masterclasses, workshops,sessions and a Saturday night concert/dance. This course runs alongside the Bagpipes Weekend, in a frenzy of reeds, drones and buzzing things! To the hurdy gurdy team we welcome esteemed player Anne-Lise Foy, a specialist in the music of Central France, along with the inimitable UK player Joel Turk. Mike Smith will lead beginners’ workshops for gurdy on Saturday to help get you up to speed. 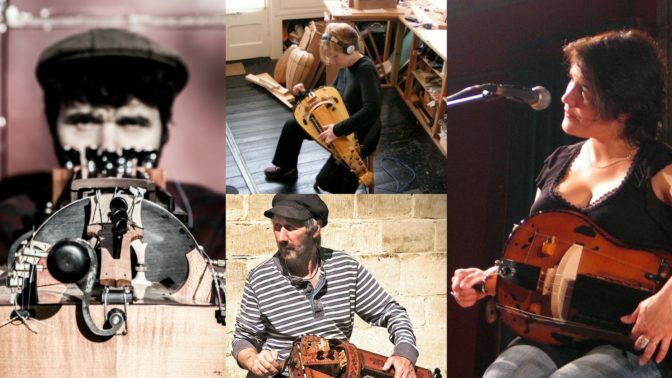 The weekend is hosted by Claire Dugué, hurdy-gurdy maker and repairer, and she’ll be available to help people get the most out of their instruments with tips for maintenance. For an extra £30, participants can stay until Monday morning, including supper and B&B. Please enquire when booking. This course will be for players of the hurdy-gurdy of all ages and abilities! Anne-Lise Foy grew up surrounded by the music of the Auvergne in Paris. A specialist in the music of central France, Anne-Lise is one of the foremost hurdy-gurdy players across a wide range of musical styles. Her musical collaborations include: Trio Patrick Bouffard, Transept, Bopiano, Freyja, Viellistic Orchestra, Les musiciens de St. Julien, and toc toc toc. Anne-Lise Foy holds two state diplomas in traditional music and teaching. She regularly leads workshops and courses in music, singing & dancing in France and abroad (Germany, England, Spain, Italy, USA). Anne-Lise will be teaching all levels of hurdy-gurdy and will also lead a singing workshop for all participants. Joel Turk started playing the Hurdy Gurdy twenty years ago. He was making a living busking, after spending a year studying Indian classical music – he was broke and somebody said that a hurdy gurdy was “a licence to print money”. They lied. What was true however is that it took Joel all over western Europe, playing at festivals, going to out of the way places and meeting musicians from all over the continent, swapping stories and music. He settled in France and spent a few years playing on the Bal circuit with Red Dog Green Dog, Zef and various ephemeral outfits whilst working as a hurdy gurdy teacher for the Ecole de Music et Danse des Landes. Joel still loves playing music for dance and divides his practice between this and more contemporary technique nerdism which he does in a small dark room where no one can hear him. When Joel teaches he likes to concentrate on left and right hand technique and tricks, how to put the two together and using traditional music as a springboard for improvisation. He believes that the inherent restrictions of the instrument are the key to its limitless potential. Mike Smith has been playing Hurdy Gurdy for about 18 years. He currently has four gurdies; two made by Chris Eaton, a lovely old Pajot made in 1862, and has recently taken possession of a Largo made for him by Sebastian Hilsmann. Mike plays in a band called ‘Venn’ who play a range of music for dancing. They play a lot of tunes written by friends as well as traditional stuff from France, Brittany, Britain, Gallicia, Ireland etc etc. Mike was our beginners tutor at last year’s event, and he has been to every one of the Halsway Hurdy Gurdy and Bagpipe weekends since they started!